Support groups and 12-step programs designed for dually diagnosed individuals help some in recovery, but many still face major obstacles to navigating substance abuse and mental health treatment systems in need of integration. Recovery from substance abuse can be a lonely—if not terrifying—journey. Recovering means fighting to stay clean while integrating back into community, workplace, and family situations that may not support sobriety. Add a mental health condition to the recovery picture, and the challenges are compounded. Not only do individuals with co-occurring disorders battle to stay clean, but they must seek out services for their mental illness, find support groups that cater to their unique needs, and deal with a double dose of societal stigma. This gap in the recovery experience of singly and dually diagnosed individuals belies a larger and persistent clinical and policy gap between the worlds of substance abuse and mental health. Despite years of discussion about the importance of integrating services, many with co-occurring disorders who are recovering continue to encounter a system that is fragmented and dysfunctional. For people with co-occurring disorders, struggles emerge even before recovery begins. According to the 2010 survey by the Substance Abuse and Mental Health Services Administration (SAMHSA), of the approximately 9 million Americans who have co-occurring disorders, only 14% received both substance abuse and mental health treatment in the past year. Nearly 38% received no treatment at all. There are many barriers to accessing treatment for co-occurring disorders, Delisi says. 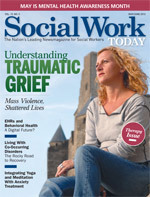 Primary among these barriers is that people with co-occurring disorders often cannot find service providers who will address both issues at one time; mental health providers may not work with someone who is actively using, and substance abuse providers may not feel competent enough to address mental illness. This forces clients to use different providers for treatment and/or address one issue at a time—options that are not as effective as integrated care. The barriers remain once someone with co-occurring disorders is in recovery and tries to access community-based services, says Keith Lisenbee, LCSW, CEO of Atlas Behavioral Health Consulting in Atlanta. “What ends up happening is that people have to go to several different places to get their needs met, and if they have to work or have child care challenges, it’s much more difficult to coordinate everything,” he says. People recovering from substance abuse often find a reprieve from the challenges of everyday life in 12-step groups such as Alcoholics Anonymous (AA) and Narcotics Anonymous (NA). There are an untold number of stories about how such programs have helped individuals in recovery develop self-confidence and self-efficacy through camaraderie with their peers. But people with co-occurring disorders can find such groups to be places of rejection, not support. That’s because many of these groups are so focused on keeping a person off alcohol or drugs that discussions of mental illness, let alone discussions of psychotropic medications, are seen as distractions, if not as an undermining of the group. People recovering from co-occurring disorders also may find that factors outside their control threaten their economic stability. One major hurdle is that people with co-occurring disorders sometimes have criminal records, which makes it harder for them to find employers willing to hire them, says Barbara Hester Bishop, volunteer director at Trinity Community Ministries, a nonprofit in Atlanta that serves men who are homeless, the vast majority of whom have both drug dependency and mental health issues. A lack of employment history also can make it harder for people with co-occurring disorders to find stable housing because they are subjected to credit checks as part of the rental or mortgage process, adds Ali Clyde Wilson, Trinity Community Ministries’ lead case manager. When one considers all these barriers in light of the top predictors of relapse, such as lack of adherence to treatment, lack of social support, and low socioeconomic status, it’s no wonder that people with co-occurring disorders are at risk in recovery, says Deni Carise, PhD, deputy chief clinical officer with CRC Health Group and an adjunct clinical professor at the University of Pennsylvania School of Medicine. “They definitely do face more challenges,” she says. Recognizing the challenges that people with co-occurring disorders face in recovery, efforts have been made to reduce the barriers. Perhaps the area in which a change in approach has been most apparent is the increase in the prevalence of mutual aid/support groups and 12-step programs specifically designed for people with co-occurring disorders. Among the best known of these groups are Double Trouble in Recovery (DTR), Dual Diagnosis Anonymous, and Dual Recovery Anonymous. Magura, who has researched DTR for more than a decade, says groups that address co-occurring disorders provide places where accepting and emotionally safe discussions of mental health are common. “People in these groups can exchange their experiences in that regard—their experience with medication, with side effects, with how to titrate their medication,” he says. • Laudet, Magura, Vogel, and Knight (2000) analyzed interviews with 310 DTR participants and found that interviewees who reported higher levels of support and more frequent DTR attendance were more likely to report lower substance use and mental distress and higher levels of well-being. • When patients in a psychiatric continuing day treatment program who entered the program before the availability of DTR meetings were compared with patients who had access to such meetings, the latter group had significantly fewer days of alcohol and drug use, more frequent use of traditional 12-step groups, and higher adherence to psychiatric medication (Magura, Rosenblum, Villano, Vogel, Fong, & Betzler, 2008). • During focus groups conducted with DTR groups in New York and Michigan, participants reported that the groups provided both cognitive/emotional benefits, such as a sense of community, feeling respected, and gaining insight into the relationship between mental health and substance use, and practical benefits, such as information about medication and medication adherence (Matusow et al., 2013). Despite their promise, groups such as DTR are not a panacea. They still tend to be far less available than AA and NA, and Magura acknowledges that there needs to be a push to make the groups more accessible. Clinicians can play a major role in this effort by empowering clients to start and maintain groups, he says. And such groups may not appeal to everyone with co-occurring disorders. Some attract people with severe mental illness, and people with less serious mental health issues may not feel that they belong, Carise says. Delisi adds that, because of the nature of mental illness, some dual diagnosis groups struggle to remain established over an extended period of time. “It can be hit or miss,” he says. Integration on the clinical and policy levels has not been as apparent, and a lack of understanding and cooperation persists between substance abuse services and mental health services. Yet there are signs that the situation will improve. For example, federal health care reform encourages both integration of services and greater parity in insurers’ coverage of and payment for substance abuse and mental health services, Carise says. Delisi adds that the advocacy work of organizations such as SAMHSA, the American Society of Addiction Medicine, and the National Alliance on Mental Illness has increased public and clinician awareness of co-occurring disorders. “I think it will be a slow process, but I do see that we’re moving in a positive direction,” he says. Delisi is among those providers who give a glimpse into a world where integrated recovery care for co-occurring disorders is the norm rather than the exception. At Hazelden, he works on an interdisciplinary treatment team that includes providers focused on mental health, physical health, addiction recovery, wellness, and spiritual care. Trinity Community Ministries also attempts to provide guidance about living with co-occurring disorders to its clients by encouraging its graduates to return and share their experiences. The graduates can mirror what successful recovery from co-occurring disorders looks like, says Wilson, himself a graduate of the program. “That offers [clients] hope that things can be different,” he says. A key component of continuing progress in the area of co-occurring disorders is educating clinicians that evidence-based interventions that address both substance abuse and mental health issues do exist, Lisenbee says. He believes that many clinicians would embrace integrated approaches if only they knew more about them. But Magura fears that trying to convert clinicians well established in their single-focused practices may be a lost cause. A mindset of integration of services needs to be developed at the time when clinicians are initially trained, he says. Jocelyn has been a recovering alcoholic and living with a stabilized bipolar disorder for 11 years. She recently shared her recovery journey in e-mail and phone correspondence with Social Work Today. The journey has been long and difficult, as Jocelyn has struggled to find the right fit in Alcoholics Anonymous (AA) while taking care of her mental health needs. However, the journey also has given her new insights about the interactions between substance abuse and mental illness. Her responses have been edited for space and clarity. • What has been your experience with 12-step support groups such as AA and groups that focus on co-occurring disorders? AA gets a bad rap for stigmatizing mental illness. There is a lot of stigma in (some AA groups) from people who don’t follow the actual literature and tell people terribly dangerous things, like they aren’t sober if they take medication, and make terrible suggestions for people to go against the advice of their doctor. If you go to certain groups, this is what you’ll get. But there are lots of groups that don’t do this. There are dual diagnosis anonymous meetings, but I’ve always found them to be scattered and filled with people who don’t have a lot of recovery time. • Why can it be so difficult for people with co-occurring disorders to find support groups and service providers that “understand” them? To preserve the fellowship, AA has a singleness of purpose: for its members to stay sober and to help other alcoholics to achieve sobriety. Mental health groups don’t seem to focus on substance abuse because, as far as I have ever seen, many doctors and therapists don’t understand the diseases of alcoholism and addiction. I have said many, many times that I have two diseases, which left untreated, will both kill me. They both play off one another, and it’s sometimes hard to tell them apart. It’s a process to figure out the right combo of both (substance abuse and mental health services). And many times, both support systems are blind to the possibility that there might need to be an additional tweak to the other side. • How have you found the right balance between being an active participant in AA while also making sure you’re attending to your mental health? It’s hard to figure out when the “symptoms” of my disease are just the result of not being on top of the “daily reprieve” from working the steps and being in line with the spiritual aspects of my recovery program and when they are the result of a chemical imbalance because of poor sleep hygiene, bad eating habits, need for a change in medication, change in circadian rhythms due to seasonal changes, etc. If I’m (going to meetings and working the steps) and I’m still feeling that something’s wrong, then it’s probably not my alcoholism. Then I can call to see someone or look at my medications. It’s been a lot of trial and error and pain and heartache sometimes, but experience is often the best teacher. • What advice do you have for people with co-occurring disorders in recovery? Advocate, advocate, advocate for yourself. Laudet, A. B., Magura, S., Vogel, H. S., & Knight, E. (2000). Support, mutual aid and recovery from dual diagnosis. Community Mental Health Journal, 36(5), 457-476. Magura, S., Rosenblum, A., Villano, C. L., Vogel, H. S., Fong, C., & Betzler, T. (2008). Dual-focus mutual aid for co-occurring disorders: A quasi-experimental outcome evaluation study. American Journal of Drug and Alcohol Abuse, 34(1), 61-74. Matusow, H., Guarino, H., Rosenblum, A., et al. (2013). Consumers’ experiences in dual focus mutual aid for co-occurring substance use and mental health disorders. Substance Abuse: Research and Treatment, 7, 39-47. Vogel, H. S., Knight, E., Laudet, A. B. & Magura, S. (1998). Double trouble in recovery: Self-help for people with dual diagnoses. Psychiatric Rehabilitation Journal, 21(4), 356-364.